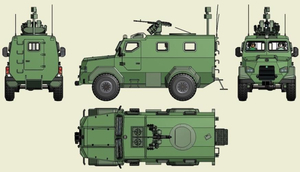 Multipurpose basic Light Armoured Vehicles providing facilities of using with their modification for interservice battle, special services and tasks. Intercom system, Overpressure System (OPS), Air Conditioning System (ACS), Automatic Fire Fighting System (AFFS), Central Tyre Inflation System. (CTIS) and or Run Flat Tyre, Inside monitor camera system, Outside day/night observation camera system for monitoring vehicle surroundings and support sternway. 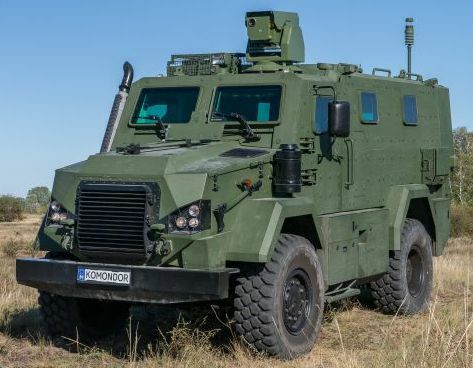 Ballistic and mine protection are according to NATO STANAG 4569 Ed.1 using metal and non-metallic materials as well safety glasses as transparent part of armour. Ballistic protection – against bullets of small & medium calibres’ weapons Mine protection – up to 3a/3b. Equipped with Night Vision Gogless (NVG) for commander and driver. 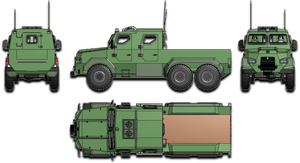 Mobile command post; CBRN reconnaissance vehicle; Forward observer; Reconnaissance vehicle; Armoured ambulance vehicle; Mortar carrying and launcher vehicle; ATGM carrying and launcher vehicle; Air defence missile carrying and launcher vehicle; Recovery or other logistic vehicle and any other variant for special tasks. Fast reaction to delivery of small series (even some pieces). 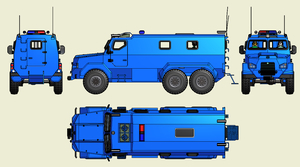 This vehicle was created as a result of cooperation with Gamma Technical Co. at Light armoured CBRN reconnaissance vehicle development project winned a KMOP-1.1.4-09-2010-0092 support.